An easy-to-do nail art design is what every girl would want. No matter if you are a pro at doing nail art or just a beginner, the easy nail arts make life a lot easier and colorful, that too in minutes. Today I am sharing one of my favorite nail arts which can be tried by the beginners with ease. In this nail art I have taken the help of a piece of sewing thread. I love using household things to do my nail art. They are inexpensive, always there in the house and works great, sometimes better than professional nail art tools. Apply the base color which you have selected. It is important to allow the base color to completely dry before moving on to the next step. You can apply different colored base coats on different nails. Now apply nail polish on piece of a paper or plastic. Take the sewing thread and dip the middle of the piece on the polish. Now hold the ends and place the colored portion on the nails creating lines. You can do random lines; horizontal, vertical, diagonal, anything you like. 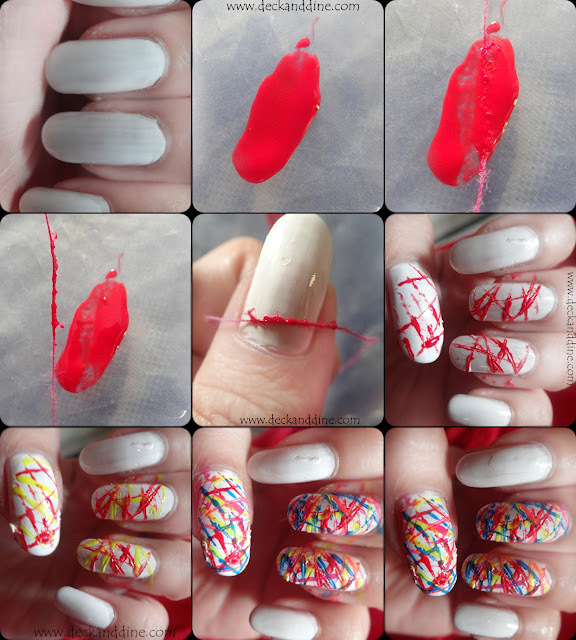 For convenience, you can stick one end of the thread with sellotape and then do your nail art. Now do the same with other colors as well. Clean the sides of your nails, apply top coat and you are done. You can do this design on all of your nails or on 2-3 nails as per your choice. Like I did a color dropping down design on my little finger. First I thought of leaving the index figure white, then I went with yellow polish and finally went with thread dipped in polish to round off the look. I hope you liked the nail art. Don’t forget to pour in your comments , suggestions and give a G+ if you like it. Wishing you all a very happy and safe Holi. Have loads of fun. Wow you did such an amazing job. I wish I had the patience for this.